After a long, cold week of work and further digging out from an additional dumping of snow, I finish up Saturday morning errands and indoor chores, pondering my pile all the while. I glance across the backyard through a bedroom window. Like the ground that surrounds it, my pile is still thick with snow, though I can see from afar several craggy holes across the top created by the furnace of heat-producing microbes within. A good sign on a frigid winter day. 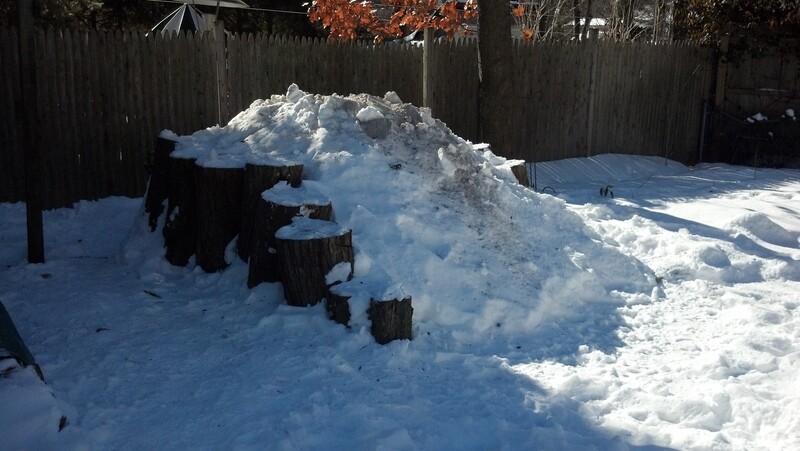 My pile, in the process of shrugging off its mantle of snow. Still, I worry that the weight of the snow covering my pile will squeeze the life out of it. Through the fall and into these winter months, my pile’s lung-like movement up and down has amazed me. It absorbs the blankets of leaves and buckets of seaweed I add to it, rising high. A day or week or so later, it settles back into itself. My pile is like the science experiment taught to grade schoolers: Here’s a glass of water and here’s a shaker full of salt. Add all that salt to the water, stir it up and wonder: where did all that salt go? So now I wonder: will all the water locked up in the snow douse my pile’s inner fire? Or will the water melt into sips that will sustain my pile’s inner workings until the sun is potent enough once again to boil it off? Like my pile, my musings about it are anything but dormant. I enjoy provoking it and prodding it along in all seasons. My pile, even in winter, is my favorite hobby, and more. I gather dustballs from under the beds and empty the fireplace of its ashes. Rather than dump the resulting brown paper bag half-full of indoor detritus into the kitchen trash bin, I decide to sprinkle it all across the top of my pile. My fast-filling bucket of kitchen scraps has nowhere to go at the moment except into cold storage in the tool shed, but perhaps this dusty blessing of gray ash and carbonized wood will help further melt the snow. I bundle up and trudge out across the snowpack to my pile. Setting the bag of ash and furry dander aside, I pick up the rebar rod I keep leaned up against the back side of the tool shed. I pierce my pile 20 or so times, from all angles and sides, circling its flanks like a caveman finishing off a woolly mammoth. I focus my prodding on places still thick with snow. I’m wagering that my pile can continue to thrive under its blanket of insulating snow, and stabbing it a few more times will activate the now dormant areas of the pile underneath. A 7-ft. length of ribbed rebar is a handy way to prod my pile, creating airshafts through and through. It’s a good, quick workout, and before long I’ve created a score of shafted pathways for meltwater to soak down through the cold, dry compartments of leaves that surely surround the areas into which I’ve forked in supplies of fresh green rotting stuff. As all the compost guidebooks say, a heap of compost should be like a damp sponge. I lean over the log wall to peer inside one of the vent holes, rimmed with hoar frost. Within is a cavern of space, creating in part by the pile subsiding and its ceiling of icy snow rising. 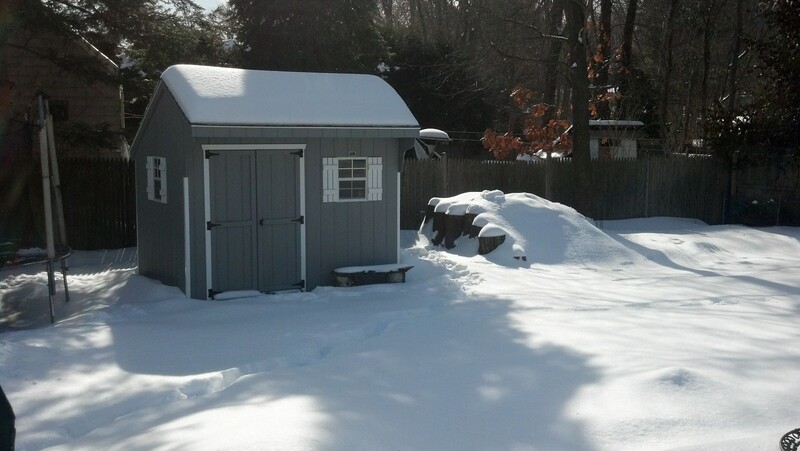 Like some salt dome down South, my pile’s covering of snow could easily collapse upon itself into a sinkhole of snow. But I figure the leaves inside have now fallen to about the level of the log walls; I decide to add more snow, if only to keep my pile high enough to pee on it in privacy. I set the bar aside and pick up the wide snow shovel to scoop swaths of crusty powdery snow from an ever-widening ring around my pile, tossing the mushed-up snow across the top. I stop to heft a few chunks of snowbergs to plug the biggest vent holes. My aim is not to smother my pile but to seal any escape hatches of heat. A thermal blanket. 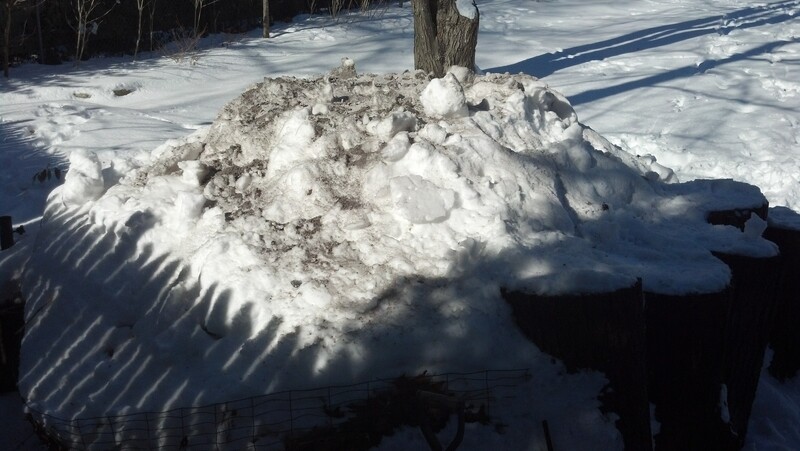 A dozen or so helpings of scrapped-up snow soon reforms my pile into a crested white butte between log walls. Happy and panting with my handiwork, I grab the bag of ash and furry dustballs. I try to stay upwind as a tilt and flick the bag full of soot across the top of my pile. Chucks of charcoal tumble down the front face, but most of the ash swirls and sticks onto the snow covering my pile. This stubble of gray will gather sunlight and melt into my pile, the ash and flecks of wood coal sinking slowly downward to add its carbon and nutrients to the mix, the warm wet water vapor rising to meet it from below. I’m sparing in the addition of wood ash, a very caustic material, to my pile. “Small amounts are fine,” advises Mike McGrath in his “Book of Compost.” “The ashes of high-quality hardwoods do contain high levels of calcium and potassium, which are essential plant nutrients. But we are talking small amounts. No more than a cup of ashes mixed into a 4 x 4 x 4-foot bin.” McGrath would rather see wood ash sprinkled across the lawn or garden (instead of lime) to raise the pH level of the soil, which tends toward the acidic in areas of plentiful rainfall. This I do, pacing across the yard as I jiggle wood ash and bits of charcoal from the paper bag. Flatow interviews Dr. Mingxin Guo is an assistant professor in the Agriculture and Natural Resources Department at Delaware State University in Dover. FLATOW: “Let’s talk about poor quality soil, a big problem around the world. Why is that? Dr. GUO: Yes. So deterioration and chemical degradation is a severe and worldwide problem. It is expressed as soil compaction, poor tubes, surface crafting(ph), slow water seepage, low water draining, low nutrients and a low nutrient retaining, and also decreasing crop productivity. This problem is mainly caused by long-term chemical fertilizer application and mechanical tillage. The level of organic matter determines the quality of our soil. All the soils have high organic matter content, say, six to 15 percent. But soil plowing makes the organic matter decompose quickly, while chemical fertilization doesn’t incur any external organic matter adhesion. So year after year, farmland soils become low in organic matter and the quality turns poor. So currently, most of farmland soils have organic matter content lower than three percent. FLATOW: Ah. So what does adding charcoal to the soil, why does it make it a better fertilizer? FLATOW: … And so, I know this is an ancient technique that was discovered in pre-Columbian tribes from the central Amazon. They were doing this 1,500 years ago. Dr. GUO: Yes. We actually, we learned this lesson from the pre-Amazon people. An archeological event disclosed the fertile, charcoal carbon-rich and highly productive soil in the central Amazon basin. And later, scientific studies revealed that this fertile soil was fertilized by the Amazon people 1,500 years ago with char produced by smothering plant debris and annual bulbs(ph). FLATOW: Ah. So the char, the fertilizer they made, the char they made 1,500 years ago, was still working? My pile is a long way from an ancient field in the Amazon jungle, but I subscribe to the theory. As I tend my garden beds and lawn and come across a chunky bit of charcoal, I think of a slash and burn farmer from a millennium before, and thank him. Ash and bits of charcoal gather sunlight on my pile and add their own properties to the mix. Late in the day I step out onto the back porch to let the dog out for a pee. The sun is low through the trees and casts its light across the top of my pile. There, I see a wisp of steam backlit by a sunbeam. My pile has already punched its way through its new mantle of snow. Life always finds a way, even on the coldest day of winter.